Budgeting for a Bathroom Remodel ⋆ Designers Northwest, Inc.
At one point, that pink-tiled shower was top of the line fancy. No one knows when that time was, but it’s definitely time for a bathroom remodel. Why stop at the shower? That gold embossed wallpaper should probably come down and the vanity could use an update. Some new tile work on the floor will certainly modernize the bathroom, too. But, it’s important to take the time to see just how much of that will cost – in time, money and comfort. Especially if that bathroom is the only one you have; painting the walls is one thing, replacing a floor is something else entirely. The average cost of a midrange bathroom remodel is around $18,500. The cost jumps to almost $59,000 for an upscale remodel, which can include increasing the square footage of the bathroom, adding a whirlpool bath, installing two sinks, and even electric in-floor heating. Start by doing your homework. Yes, that double sink vanity with futuristic bowls and cool waterfall faucets is awesome – but you may only have the money for a single pedestal sink. Determine a reasonable budget for yourself, with some contingency built in, and stick to it. 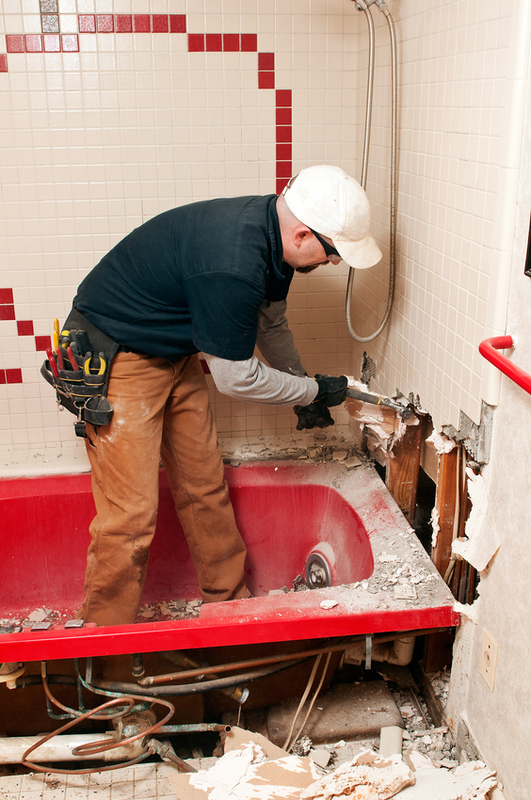 Little upgrades can add up fast when remodeling a bathroom. From there, you can decide how much of the work you are willing to do on your own. If you don’t know your elbow joint from your sink flange, you may need to get a professional involved. Be honest with yourself – it’s better to call someone now rather than later when they have to come out to fix all of your mistakes. If you are handy with a hammer, drill, and saw, doing a lot of the work yourself may make sense. An experienced home remodeler may cost more money than doing it yourself, but if you can work out an agreement on work you do, some money could be saved there. Another advantage of hiring a bathroom remodeler, electrician or plumber is the time it will save you. In a bathroom makeover, time may be the most precious resource if you’re having to take all your showers at the gym. A professional will also make sure all the wiring and plumbing is up to code. With the pink tile replaced, the painting done and the dripping faucet removed, you’ll be able to enjoy your bathroom all the more. And now you’ll have time to move on to your next remodel!